And now my day is going to revolve around how I’m irked at the lack of crumble and streusel on top. For an actual muffin to make it into my breakfast rotation, I need a few other things of substance on a plate next to it. Maybe some fruit. Peanut butter. Some eggs. BACON. Those kinds of things. That’s why I sort of prefer my muffins to be snack worthy foods. I’d never kick a muffin outta bed for breakfast but… I like them at other times of the day too. Like right now. At 10:30PM when I’m writing this post and eating my emotions because Psy makes me feel so uncomfortable as I watch him on Dancing with the Stars. If you haven’t noticed, I’ve been on a massive mascarpone kick the last few months. Putting it in EVERYTHING. Sweet, savory, using it as a spread… literally, all the things. I’ve always enjoyed it but maybe… just… never knew it’s true potential? All you italians just collectively rolled your eyes in my direction. I bet. So two weeks ago I attempted to make a lemon mascarpone loaf and it came out like… dense, unbaked cheesecake. I mean, it was SO dense. Crazy dense. Perhaps I should have measured stuffed out instead of just being a cocky brat and thinking ‘oh of course this will turn out!’ and throwing stuffed into a bowl???? Maybe, you know, figured out where things went wrong? And since I have no patience and just couldn’t handle waiting another 75 minutes while loaf cake #2 baked… muffins it was. Muffins are like the poor man’s cake. Errr… the lazy man’s cake? The impatience man’s cake? The good news is that I still covered that lemon loaf in one hell of a sugar bombed glaze and it made it’s way into multiple mouths. It’s just not perfect yet. So until then… muffins. Make-it-up-to-you muffins. Settle for now. In a large bowl, combine flour, brown sugar, baking powder, soda and salt. Stir to combine. Mix in lemon zest. Add mascarpone cheese and mix in with a fork, stirring until crumbly, evenly dispersed and covered in flour. In a small bowl, whisk together milk, yogurt, egg, vanilla extract and butter. Add the wet ingredients to the dry, stirring until just combined and wet. Use a 1/4 cup measure or ice cream scoop to fill the muffin liners 2/3 of the wall full. Bake for 15-17 minutes, until tops are set and golden. Remove and let cool slightly before serving. Ha! I get cocky too sometimes and then it’s a disaster. But look what came out of that disaster? Beautiful muffins! Love the muffins and I know what you mean about cakes….if they don’t turn out on the first try, it’s hard to want to remake them, wait for them to bake, etc. Muffins are the answer then, of course! And I love that they’re made with brown sugar and Greek yogurt! Wow, these look really good. I love lemon muffins! I can only say that my relationship with cake has hit a snag since going back to school. I find that I never have enough time to make a cake just right. I have only recently warmed up to the muffin culture. So simple but just what you need if you want cake for breakfast. I have some masacrone cheese that needs to be used, umm I’m thinking these muffins! What a great recipe! Muffins are snack food to me. I mean cause I could say I need a snack every hour and I can’t really go around saying I need breakfast every hour. You know? This way I can have a muffin an hour if I want! Which I obviously do cause I love mascarpone!! Oh and lemon and muffins in general.! I am the absolute worst for following directions! These muffins look amazing though, and I see nothing wrong with eating 2 (or ten) for breakfast! I want these right now! I’m all over lemon baked goods recently! I adore mascarpone, but for some reason never really consider it as an ingredient when I’m poring over the cheese counter. These might change all that! Can one ever use too much Mascarpone? I think not. You, me and a case of mascarpone are doing big things today. I freaking love that stuff. 1+++ muffins + a ton of other things are my breakfasts. I’d be extremely grumpy if I only had just 1 muffin for my meal. The mascarpone, the brown sugar, the yogurt = these are fantastic Jessica! I definitely don’t think I could have just one muffin. I mean especially because they are lemon and any lemon I’m kind of obsessed with right now. Just found your blog on twitter – recommended people to follow. Really enjoying your photos. Thanks for the inspiration! I do consider muffins a breakfast food that doubles as a snack food! I do like spreading peanut butter on them or eating them with eggs. Protein is necessary at breakfast! 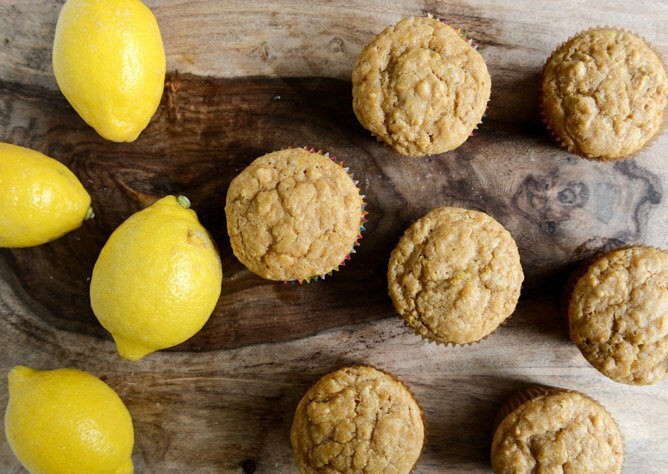 These muffins sound so great with lemon & mascarpone. Very substantial for breakfast! I LOVE muffins, and one is NEVER enough, especially, when it comes to these muffins! They sound amazing! One of these luscious little lemon babies could never do. If I start with 4, do you promise not to judge? Haven’t yet decided what to have for breakfast yet, but I’m pretty sure I’ve decided it’s THESE. Nom. Mascarpone in a muffin? Looooooooooooooooooooove it! There is definitely a cartoony cat face in the wood knots of your cutting board (or whatever the wood is in these photos). Do you see it?!? I had never eaten mascarpone until making your butternut squash lasagna (which my family is OBSESSED with) so I will absolutely try these muffins. MMM! Also, no, one muffin does not make a meal. Hellll no. I am not sure if I qualify as a “normal person”, but I would have to say that no, one muffins does not qualify as breakfast… neither does special K. I am hungry within 30 minutes! LOL I totally agree with you about eating only a muffin for breakfast. I am not sure how people feel satisfied. These look great! Ok, I thought maybe I was just a fatty who wasn’t satisfied by a single muffin for breakfast so thank you for bringing that up. I feel like I need at least 3 muffins to be satisfied. And even then, I’ll probably be hungry in 90 mins. muffins are definitely more of a snack for me, rather than a full breakfast. and mascarpone sounds lovely in these! Lemon and brown sugar together are actually pretty awesome but rarely paired. I love the idea of this muffin. Looks amazing! Mmmmmmascarpone! Yum! 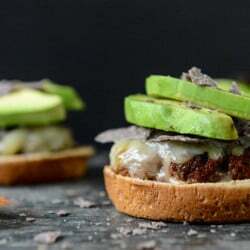 If you’re looking to make these breakfast-worthy how about adding some chia seeds and flaxseed for some filling protein and fiber! One muffin (of traditional size) never qualifies as breakfast–it’s only a couple of bites! And when it’s a really good muffin…well, then there’s got to be at least two …. and maybe a snitched bit of a third. Anyways, these look awesome deliciousness! Like quite a few others, I”m currently completely obsessed with lemons! I die for anything with lemon in it! Love, love, love these muffins! These look so amazing!! YUMMY! Rarely can I exist on muffin or for a meal… But I guess it depends on the muffin! Holy typos- I meant exist on one muffin as a meal. just made these…they are amazing. and i am not usually a fan of lemon anything sweet. and I thought you were supposed to eat at least two muffins for breakfast, one while your coffee cools down a little bit and one with the coffee. right? ugh, THANK YOU for acknowledging the self-evident, yet never-spoken truth that one muffin does not a satisfying breakfast make. basically it just makes me hungrier. anyway, these sound divine. long live lemon! Eat only 1 muffin?? haha, yeah right! If someone said they only eat one muffin, they’re totally pulling your leg. I usually eat at least 4… fine, more like 5. Mmm I have some ricotta rolling around, might have to give these ago. Also totally in your court, you always need more than one, otherwise it’ll be lonely in your tum! My gosh you take such yummy photos of your creations! Love it! Love that there is streusel on top! Perfect! I love simple, old-fashioned muffins! Sometimes the crumble and glaze and stuff gets to be too much – did I just say that…er…type that?! Can these be baked with regular all purpose flour and plain yogurt? Also, what do you think is a rough calorie guesstimateper muffin? They look so good!!! Thanks for all your posts btw. I try to start off my work day reading them to get me into a better mood. You write like I think in my head!! Plus I gave your blog site info to a few colleagues and they also adore you! The name alone made me hungry! can’t go wrong with muffins! Answer? No way. One of those tiny muffins for breakfast would last me maaaaybe 20 minutes. After that I’d probably have a sugar crash and eat 3 eggs smothered in cheese to compensate. Not a good idea for me to eat muffins for breakfast? Snack though? Totally doing it.